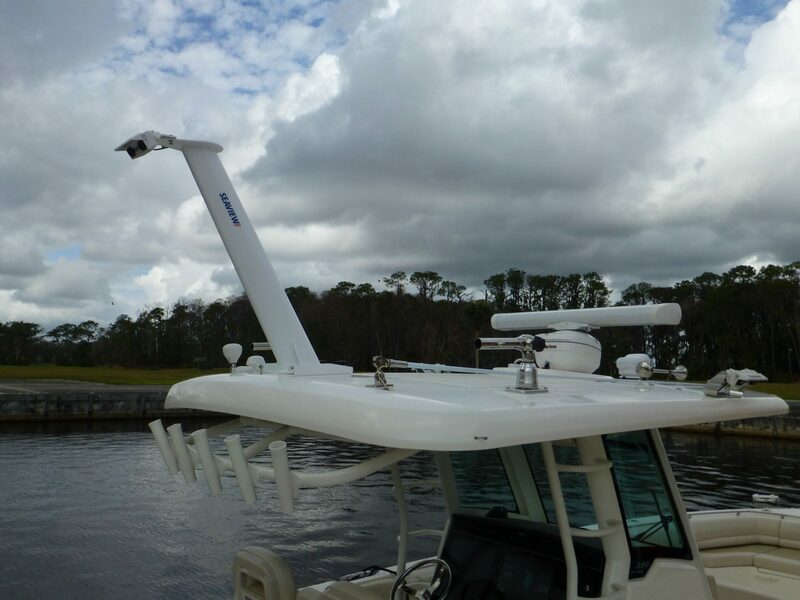 With Virtual Bumper you still drive the boat, but 3D cameras are monitoring the situation in all directions and if any object violates a three-foot perimeter, the system takes over the controls and gets you back to safety. 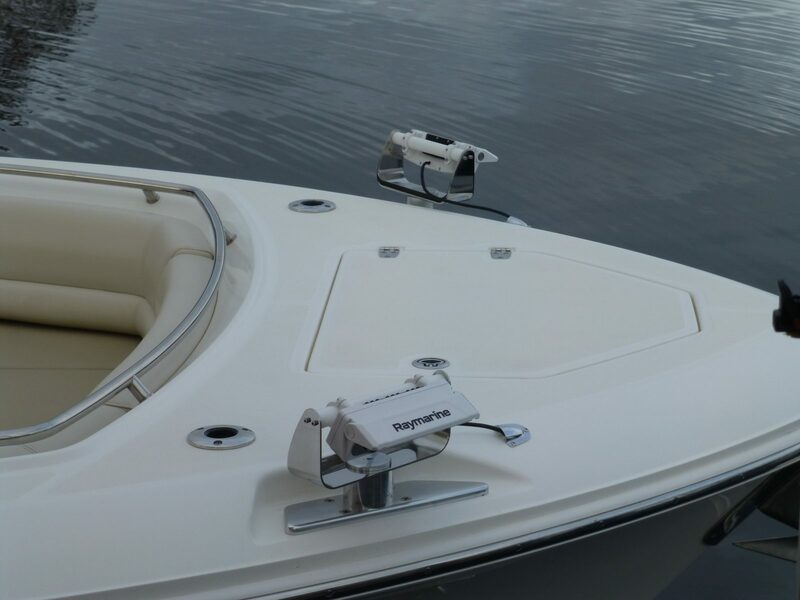 Once the boat is in a good docking position, you can simply turn the bumper off, or you can even tell it to bring the boat alongside the dock or seawall. I have lots of details to share about how it works and what it’s like to use. 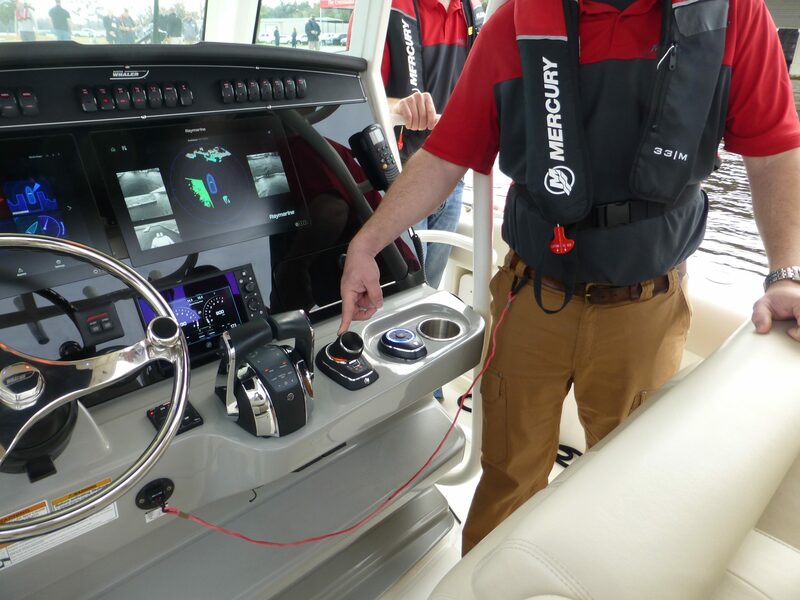 What I saw installed on a Boston Whaler Outrage 330 at Mercury’s Lake X test site is a combination of Raymarine’s DockSense with Mercury’s Advanced Pilot Assist (APA) system. (APA is the umbrella term Mercury uses for their joystick piloting, autopilot, and Skyhook dynamic positioning.) One of the metaphors offered to explain the relationship between these two systems is that DockSense is the eyes and ears while APA is the hands and feet of the operation. DockSense builds a model of all the objects around the boat which it then shares with Mercury’s APA. 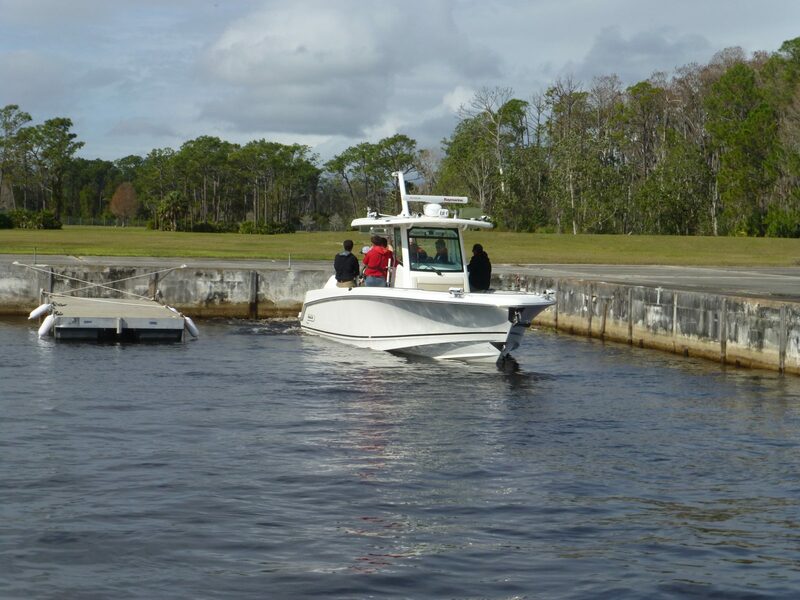 APA then makes decisions about which objects have gotten or are getting too close and uses the outboards to maintain the 3-foot Virtual Bumper radius used by the system demonstrated Friday. The 3-foot radius is fixed for now but will almost certainly be configurable on a released version of Virtual Bumper. Although Raymarine and Mercury both made it clear that what they demonstrated is not yet production-ready, it seemed polished and worked well. I never saw the system get confused or otherwise stumble while the corrections it made were smooth and proportional to the hazards. As soon as the Virtual Bumper (represented as the blue glow around our boat on the DockSense screens) is activated, the vessel will move so the bumper zone is clear on all four sides. During our demonstration, the Whaler started off with the starboard side to a seawall. Once the Virtual Bumper was activated the boat moved to port to create the 3-foot safety margin. As we floated around another boat pulled within a few feet of our bow at which point the Outrage backed itself up a bit to preserve the safety margin (cool!). 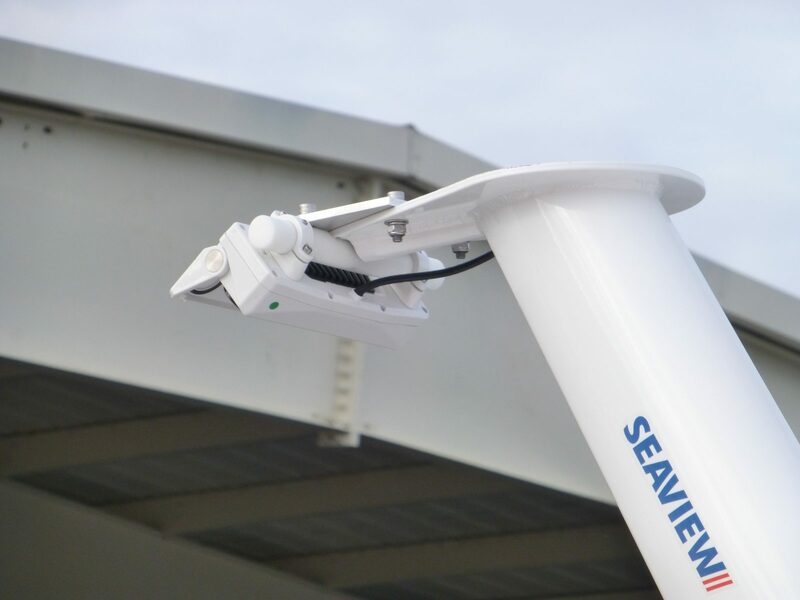 We then moved away from the seawall and towards another seawall and floating dock, all under the watchful eye of the DockSense cameras. As we backed toward the floating dock we were on a line that would have brought our stern within 3 feet of the dock. Pulling straight back on the joystick resulted in the boat sliding straight back and then sliding just enough to port to ensure the three-foot margin was preserved. Mercury explained the new version of APA on our test vessel also corrects for environmental conditions, so if there were a strong current or wind pushing the boat sideways, pulling straight back on the joystick would still result in the vessel moving straight back as APA makes appropriate corrections. The helmsperson interacts with the Virtual Bumper controller pictured about with its directional pad and blue glowing LED ring. When DockSense detects an object, the corresponding segment of the LED ring will blink. If you then tap that direction’s button the Virtual Bumper for that direction will be deactivated and the system will let you maneuver closer to an object on that side. If instead the operator presses and holds the arrow button the vessel will autonomously move alongside the object on that side and hold it there. Until one of the two docking modes is activated the system simply won’t let the vessel come within 3-feet of any object. If the joystick is moved towards an object the command isn’t allowed until the Virtual Bumper is deactivated. DockSense is composed of five stereo vision cameras, each with two image sensors and an AHRS (attitude and heading reference system) built in, a sixth AHRS with GPS also built in on the hardtop, and the DockSense Processor (a black box that contains the considerable processing power required). The processor uses the various AHRS inputs to sense precise pitch and roll so it can correct for possible issues like the face of a wave or a small wake that the cameras might be seeing as a result of the boat’s movement. This is a technology demonstration project so I’m hopeful production versions of the system will employ smaller, less obtrusive cameras and possibly fewer sensors. Though neither Raymarine nor Mercury discussed pricing, I suspect the current system with myriad sensors and lots of processing power is quite expensive. 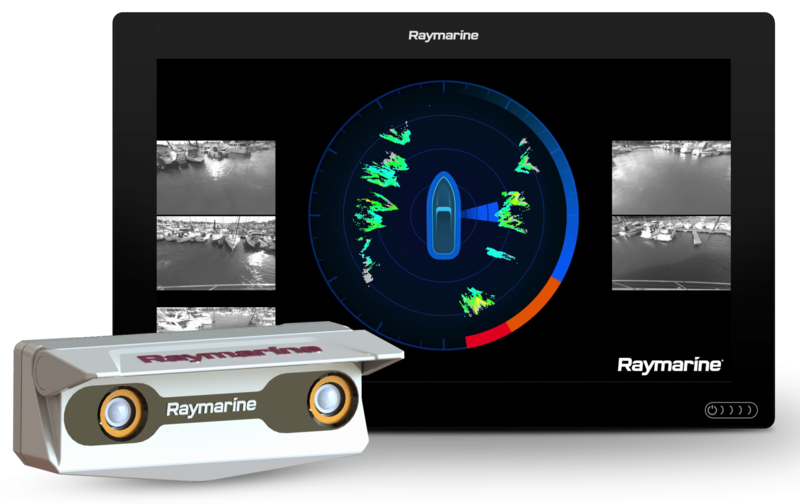 Raymarine is using machine vision technology to map nearby objects. Images from the two cameras in each module are compared to compute the distance to an object, similar to what the human brain does as it interprets the difference between what is seen by the left and right eyes. 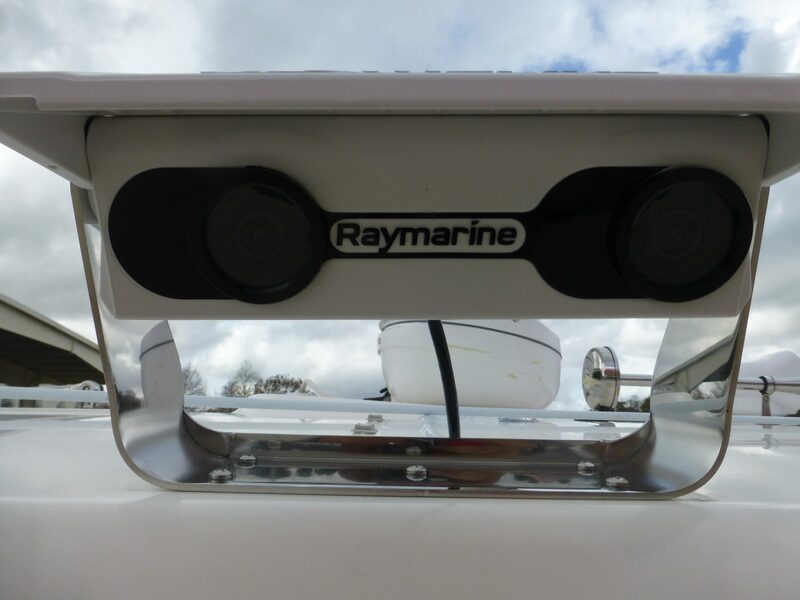 The cameras and machine vision technology come from FLIR (which recently acquired specialist Point Grey Research), but Raymarine developed the marinized housing with the built-in AHRS and a powered shutter to prevent spray from getting on the lenses underway. 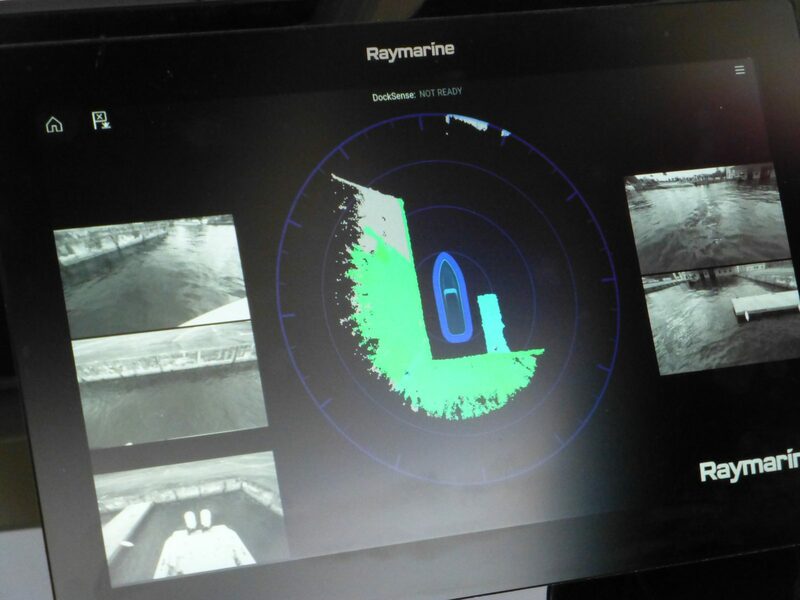 In the pictures above you can see the actual location of the Outrage and the visual model DockSense built using the output of the five stereo vision cameras and which typically covers a 50 square meter area centered on the boat. Note that there are three distinct color codes: gray indicates an object previously mapped but not currently seen, green indicates a higher object like the seawall (in this case) currently seen, and light blue shows lower objects like the floating dock, also currently visible to the system. The demonstration Boston Whaler has excellent sight lines but the DockSense display on the Raymarine Axiom MFDs is good enough that I’m pretty confident it would work well with much poorer visibility of nearby objects. In fact, I think that the DockSense visualization technology would be a real benefit at the helm without the Virtual Bumper propulsion control. I’ll also note that because the DockSense cameras can measure distances to an object, they’re not fooled by something like a crew person walking in front of a camera. If something is detected within the perimeter of the boat, it’s simply ignored. 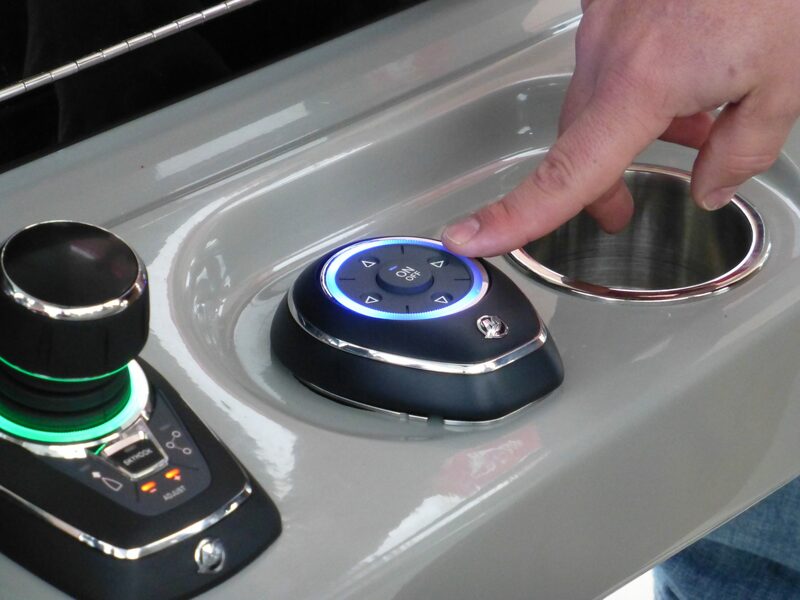 The technology demonstrated at Lake X feels like the very tip of the iceberg of autonomous boating, though I think most recreational boaters are likely to be more interested in docking assist technologies like Virtual Bumper rather than fully autonomous operations. But then again, Volvo Penta has already demonstrated a fully autonomous self-docking system aboard an IPS powered boat, though that system requires beacons placed on the dock. Raymarine has also partnered with Prestige to integrate DockSense onto an IPS powered Prestige 460 to deliver similar Virtual Bumper capabilities. They’ve made a pretty entertaining video touting the system’s ability to make anyone look like a pro. Adding Virtual Bumper to the numerous other assistive technologies already on the demo boat make it seem as though more ambitious capabilities aren’t far away. In fact, the current capabilities of DockSense seem a natural fit for underway collision avoidance. I should also mention that I demoed the technology on a nice day during full daylight without inclement weather, significant wind or current. I can’t say how the system would have performed in more adverse conditions but I can say that it performed without a hitch in good conditions.